Description: Tree-like plant 3–4 m high, sometimes with a distinct trunk. Segments ± circular, compressed, mostly 20–25 cm long, bluish green, glaucous. 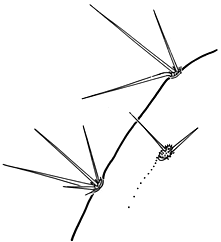 Spines 1–12, brown or yellowish at base, white above; mostly 8–12, to 5 cm long, spines sometimes absent. 5 cm diam., yellow, often unisexual. Fruit ± globose to ovoid, 7–8 cm long, pink to purple. Distribution and occurrence: Naturalized but not common in N.S.W., confined to areas near the Vic. border and Broken Hill. Native of Mexico.